It's amazing, a wonder, that one wakes up in the morning. And much chasing the wind. I have to let go of the need to know so much. What we can know is so small---the holiness around is so large. Now I trust in simplicity, simplicity and love. 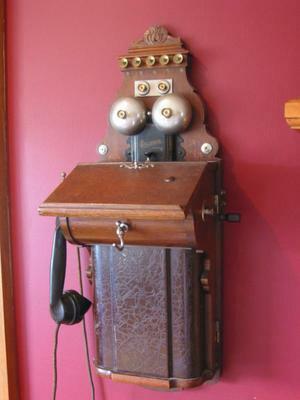 When I was quite young, my father had one of the first telephones in our neighbourhood. I remember well the polished old case fastened to the wall. The shiny receiver hung on the side of the box. I was too little to reach the telephone, but used to listen with fascination when my mother used to talk to it. My first personal experience with this genie-in-the-bottle came one day while my mother was visiting a neighbour. Amusing myself at the tool bench in the basement, I whacked my finger with a hammer. The pain was terrible, but there didn't seem to be any reason in crying because there was no one home to give sympathy. I walked around the house sucking my throbbing finger, finally arriving at the stairway. The telephone! Quickly, I ran for the footstool in the parlour and dragged it to the landing. Climbing up, I unhooked the receiver in the parlour and held it to my ear. "Information Please," I said into the mouthpiece just above my head. A click or two and a small clear voice spoke into my ear. "Information." "I hurt my finger. . ." I wailed into the phone. The tears came readily enough now that I had an audience. "Isn't your mother home?" came the question. After that, I called "Information Please" for everything. I asked her for help with my geography and she told me where Philadelphia was. She helped me with my math. She told me my pet chipmunk that I had caught in the park just the day before would eat fruits and nuts. Then, there was the time Petey, our pet canary died. I called "Information Please" and told her the sad story. She listened, then said the usual things grown-ups say to soothe a child. But I was un-consoled. I asked her, "Why is it that birds should sing so beautifully and bring joy to all families, only to end up as a heap of feathers on the bottom of a cage?" She must have sensed my deep concern, for she said quietly, "Paul, always remember that there are other worlds to sing in." Somehow I felt better. Another day I was on the telephone. "Information Please." All this took place in a small town in the Pacific Northwest. When I was 9 years old, we moved across the country to Boston. I missed my friend very much. "Information Please" belonged in that old wooden box back home, and somehow never thought of trying the tall, shiny new phone that sat on the table in the hall. As I grew into my teens, the memories of those childhood conversations never really left me. Often, in moments of doubt and perplexity I would recall the serene sense of security I had then. I appreciated now how patient, understanding, and kind she was to have spent her time on a little boy. A few years later, on my way west to college, my plane put down in Seattle. I had about half an hour or so between planes. I spent 15 minutes or so on the phone with my sister, who lived there now. Then, without thinking what I was doing, I dialed my hometown operator and said, "Information, Please." Miraculously, I heard the small, clear voice I knew so well, "Information." I hadn't planned this but I heard myself saying, "Could you please tell me how to spell 'fix'?" I laughed. "So it's really still you," I said. "I wonder if you have any idea how much you meant to me during that time." "I wonder," she said, "if you know how much your calls meant to me. I never had any children, and I used to look forward to your calls." I told her how often I had thought of her over the years and I asked if I could call her again when I came back to visit my sister. Three months later I was back in Seattle. A different voice answered "Information." I asked for Sally. "Are you a friend?" she asked. "Yes, a very old friend," I answered. "I'm sorry to have to tell you this", she said. "Sally had been working part-time the last few years because she was sick. She died five weeks ago." "Well, Sally left a message for you. She wrote it down in case you called. Let me read it to you. The note says, 'Tell him I still say there are other worlds to sing in. He'll know what I mean.'" I thanked her and hung up. I knew what Sally meant. Never underestimate the impression you may make on others. On that note I would like to ask you to remember how much difference one person can make in someone's life. ORIGINS: Some of us tend to think the Internet age spawned the current spate of sentimental tales, because for many our first contact with these gems was their appearance in our inboxes. Yet glurge [link] has been circulating in its current form for decades, as evidenced by this current story about the friendship between a little boy and a telephone operator. "Information, Please" was first published in 1966 in Reader's Digest, a magazine known for offering at least one of these "slice of life" heartwarming yarns in each issue. There are differences between the version circulated on the Internet (which is the text used as the example above) and the original as it appeared in Reader's Digest. For the most part, these differences amount to the dropping of a line here and there, the changing of one word into another (the "tall, skinny new phone" becomes the "tall, shiny new phone"), and the rendering of words from the original story with British rather than American spellings ("neighbor" instead of "neighbour"; "parlor" instead of "parlour"). Perhaps whoever transcribed this story from the original was working with a hard-to-read photocopy. Added are the two lines that now close the piece: "Never underestimate the impression you may make on others. On that note I would like to ask you to remember how much difference one person can make in someone's life." In the original, the story concluded with "I thanked her and hung up. I did know what Sally meant." Unlike whoever took it upon himself to edit the piece, Paul Villiard trusted his readers to understand the moral of his tale. Is this particular entry a true story? It (like many others) was presented as a "first person tale," but glurge-like stories are often full of embellishments and exaggerations — and are sometimes complete fabrications — despite their "true story" labels, and tracking down the originator of a single 36-year-old piece is no easy task. As usual, the better approach to this type of narrative might be to ignore the issue of its literal truthfulness and consider the message: Does this wistful tale truly represent life as it was — a now-gone world in which even anonymous telephone operators took time out to comfort lonely children by helping them treat their injuries, assisting them with their homework, and offering them bits of philosophical advice — or does it represent a way of life we'd like to believe in, one that never really existed outside our imaginations? Deerfield Beach, FL: Health Communications, 1996. ISBN 1-55874-379-0 (pp. 14-18). Villiard, Paul. "Information, Please." Reader's Digest. June 1966 (pp. 63-65). 28 Aug 2006 @ 20:15 by hgoodgame : I loved the story! And it did bring tears to my eyes. I was working as a telephone operator at about the time this article was published, and based on what my experiences were working for GTE, it seems impossible that an information operator could take so long on a call and still have her job after all those years. For instance, we were constantly monitored and when working the 'information' side of the business, we had to complete a call transaction within a minute (and there were timers right at one's station), anything more and we'd be taking too long and get cited. But, as far as a story goes, it's great. It sounds lovely and who knows, maybe in some little small town in the Pacific Northwest back then they weren't so tight about all their money saving regulations as they were in Santa Barbara. Of course Urban Legends is tracing the story to the 1966 Reader's Digest version, and I presume Heidi is talking about that year regarding her work experience. It does sound very "1966" to me, being something of an expert on the Reader's Digest perception of reality during that period. Both my parents read the magazine religiously and became so indoctrinated they fell right into Ronald Reagan's lap. Their view turned to anger and bitterness some years later as benefits for the elderly shrank to subsistence levels. But if the telephone was invented sometime in the middle of the 19th Century, and maybe became widely available, in North America anyway, as we entered the 20th, when could this story have taken place? The "plotline" resembles radio and movie tearjerkers from the late '30s and early '40s. I don't mean soap opera, but rather radio theater dramas and Jimmy Stewart/Margaret Sullavan flicks---or an O. Henry short story. The true brilliance of the tale is planting the "other worlds to sing in" line in Sally's response to the death of Petey. That Sally would leave a note for Paul upon her final retirement, that he would call back---and how do you call your "local operator" from Seattle?---and the new operator would have it at hand should tip us off we're being set up, but by that time we're ready for the climax and let it happen. What we have here is a well-written story. But is it real? My friend, the social scientist who has spent his entire career checking facts and chronicling statistics, wrote me back, "Richard, I gave into my sentimentality, happily. Whether the story is true or not, I welcomed the warm feelings I got from it." On a more sociological note he echoed the realities to which Heidi refers: "At the same time, even if true, I doubt that it was typical. And it doesn't capture how most phone operators were closely monitored, poorly paid, gender stereotyped, with little real job security..." But maybe not in the small towns in the early days of the crankbox telephone that connected you to a lady in an office several blocks away. Another friend, who remembers her childhood similarly, wrote, "Of course I remember how helpful 'Information'was. One didn't bother to call the doctor's office; you called her, and she told you where he was. The postman was almost her equal, for he did keep up with your family's goings and comings. What a snug world it was." So that world did exist. I was surprised to find it at Urban Legends, but maybe there isn't a Smalltown Legends website. I guess we can't be sure where it happened, for as Barbara Mikkelson points out her version has British/Canadian spellings. I found a version of it yesterday at the website of a librarian in Singapore! Could Bell Telephone have employee records that list all the operators named Sally? Did an editor at Reader's Digest "improve" the story? At some point we have to give up the scholarly detective work I guess, and settle for the "reality" of the poet storyteller. I can live with that particularly as it is more in my field than that of the sociologist perhaps. The danger of course is the Reagan storytellers now are running the world and they gladly tell us to make up our own reality as we go along. My wife informed me yesterday "Global Language Monitor defines 'truthiness' as used by TV's Stephen Colbert as meaning 'truth unencumbered by the facts.'" If it feels good, do it? If it makes money, do it? Now we are getting serious! I'll be planning to share it. Something you share with friends. that it might have happended as well as the probability that it was an urban myth. And supposing it was such a myth, what does it tell us about the basic human needs which would cause such an invention to spread and take roots? The need for human contact and community in a big bad world? As well as a touch of magic and serendipity? Certainly over the past few years I have lived in a cul-de-sac in the centre of a big city, and it has a level of community I have never before experienced in an urban setting, one which adds tremendously to the quality of everyday life. Perhaps it's a nostalgia for this community which underpins this story.....although noticably without the in-your-face interference which could be the other side of the community coin: the human support provided by Information Please was only there when called up and asked to be! some local telephone people here in the Pacific Northwest. They told me that this could very well have happened. Most of the smaller communites back then were nothing much more than a 'mom and pop' type telephone operation. They were not supervised like the bigger main offices I had worked in and had much more freedom to spend time with their customers. 30 Aug 2006 @ 10:03 by jazzolog : Is It True? Is It Real? As I held back my particular sob upon reading the story the other day, and then decided to paste it up, I never dreamed of the responses I'd get and the puzzle that would emerge. I don't know what exactly made me Google a phrase out of it, just to see where it came from (my professor friend uncharacteristically did not include a reference). When I saw the Urban Legends site was the first time real doubt about it happening began to creep in. Most of the replies I've gotten are from those of us who can hearken back to days before wireless (interestingly that was around the time Reader's Digest published this). It's nice to be nostalgic about the telephone in a time before you had to look at the guy next to you to find out if he's talking to you or into a damned cellphone. One friend sent me her old phone number when it was only 4 digits. I remember that too, but I would have to stretch my memory to think what ours was. I know it's in my brain somewhere, but there are too many other numbers in there now...and I don't want to confuse myself. Me and numbers I have to remember is an increasingly tiptoe situation. Heidi's documentation from her phone company reaffirms the distinct possibility that something like this really happened. My friend's remark about the mailman is another indication. I even was invited over to my mailman's apartment one time to look at his stamp collection---an invitation that probably would be unthinkable today! (I'll have to write a piece about that guy sometime. Look, I'm turning into Reader's Digest right in front of your eyes!) I'm not so concerned as to whether the story is real as it may appear. In my view, if a person can think it up, as a story or poem or piece of theater, it's real. And if people read it or see it, it has the occasion to become "more" real. People are influenced and we change as a civilization. That is both the satisfying reward and horrifying danger of a great communicator. sounds like Paul HARvey to me. Nice story anyway. We are in need of funds.Please send your donations through on line banking.See details at the end of this message. ©2000-2010 St.George Orthodox Church. All rights reserved. I thought of a huge mass of solid words. Insurmountable. Impenetrable. More formidable than the Pacific Palisades. A mass of Vesuvian igneous rock. A solidified lava flow. A huge bump in the sea. Oy vey. Oy vey. In the early sixties I got a part time job with the telephone Company in a little town in northwest Iowa. There was no dial or push button phones in this little burg. It had an old manual switchboard. I was part time "central" operator for the town of 2 to 3 hundred people including surrounding farms. All of the phones had cranks on them, wooden wall phones for the farms and black bakelite desk phones with cranks for the town people. When someone would crank one short ring I would take a back cord to plug in and open my key answering "Cylinder" and wait for the response. There were no lights on the board just little brass tag "drop" that would fall forward to indicate which line to answer. They never gave a number just a name so I had to learn each number by heart and what their individual ring was on that line. Most of the lines were party lines. If they cranked more than one ring I simply just restored the drop manually as they were ringing on their own party line. I remember that the bank had one ring and the bank manager had two rings so he could answer the bank phone at night on his party line. Some of the farm lines had 15 to 18 "subscribers" we called them then. I even remember a few of the lines were called one wire lines going off into the country. Sometimes when one of these customers would wish to make a call they were hard to hear. I would ask them if they had fresh batteries in their phone and if so I would ask them to go and dump a bucket of water on the ground rod just beneath where the phone line comes into the house. They would come back into the house, call me back, and we could talk just fine. The heart of that little town left when this old board was removed and the company converted to dial phones. You had to be Dad, Mom, psychiatrist, doctor, and counsellor for this little mass of primitive phone people as all around the surrounding towns there were more modern dial telephones but these souls held out for several years until a nearby town bought the exchange for a song and converted it to dial. A customer might call and ask for Joy Jacobsen, who was one of the customers I remember, and I would say "I just saw him go into the bank, Ill ring there." I remember that there was a general alarm ring on party lines, I think it was 5 or six short rings and everybody on that line including the operator needed to get on it as it was usually a fire or other emergency. I remember this one time a little boy strayed away from the farm and his mom rang us all up. I could not leave the board but the neighbors went out looking for him. There was a button attached to the side of the switchboard and if presses it would ring the fire siren. When I pressed it the fire cheif came in to ask the location and emergency. They found the little guy o.k. by the road. That was when people really looked out for each other. It seems like a thousand years ago and so far removed from today with its modern conveniences but I still remember it as clearly as yesterday. Good memories !! !